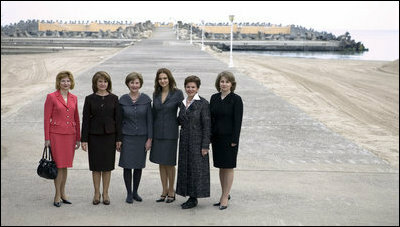 Mrs. Laura Bush and Mrs. Maria Basescu, second from left, spouse of Romania's President Traian Basescu, are joined for a photo opportunity with luncheon guests Wednesday, April 2, 2008, at the presidential seaside retreat in Neptun, Romania. Joining them are from left: Codrina Vierita, spouse of Adrian Vierita, Romanian Ambassador to the United States; Alexandra Coman, accomplished opera singer and fiancée of Adrian Cioroianu, Romania's Minister of Foreign Affairs; Jenny Taubman, spouse of Nick Taubman, U.S. Ambassador to Romania, and Maria Bitang, former Romanian Olympic Gymnastics Coach and State Advisor.